HomeNationalA Tragic Accident or Negligence? A Tragic Accident or Negligence? TAMPA, Fla. (FinalCall.com) – There is an old saying that time heals all wounds, but in the case of the Joseph family, it hasn’t proven to be the case. 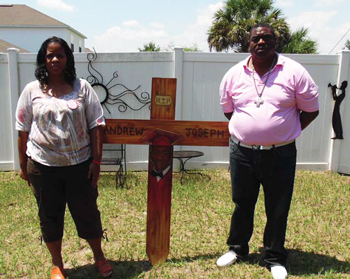 The pain of Andrew and Deanna Joseph still runs deep seven months after losing their 14-year-old son, Andrew Joseph III, in a manner that produces more questions than answers. “Pee Wee” as he was affectionately called, went to St. Stephen’s Catholic school. He was very popular amongst his classmates, was an honor student and sports star. 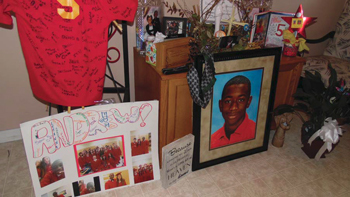 He played for the Brandon Ravens, a youth football team in the area, and excelled at track and basketball. Pee Wee’s father said his son had planned to go to the Florida State Fair for months, doing odd jobs around the house and for neighbors to earn extra money, and saving any money he received for his birthday and Christmas. It was the first time he would attend the fair, and he was excited. He used some of the money he saved to get a haircut and a new special outfit specifically to wear to the fair. There is a long-standing tradition in which free tickets from the Florida State Fair Authority are distributed to students within the Hillsborough County School District. Students are given the day off and it is really treated as something of a special holiday. Droves of teenagers meet at the Florida State Fairgrounds. Amongst the young people in Tampa and the surrounding areas, it is well known that this is the place to see people and be seen. For many it is a highlight of the school year, however, as with many popular events, it draws all types. It is also known as the place where the gangs come to fight, and quite often, the first night of the fair ends in chaos and melees. Since Pee Wee went to a Catholic school in the area, students at his school were not recipients of free tickets, but since he was so popular and well liked, he got a ticket from one of his friends in the neighborhood. A memorial in Pee Wee’s honor. His parents said he was not totally sheltered and he was used to going places on his own. He was nearing his 15th birthday, and since he was never involved in any trouble, his parents had confidence that he would make the right decisions. His parents did have concerns about their son going to the fair, but not because of the notoriously raucous atmosphere, their concern was that their vehicles were in need of repair, and the weather appeared to be threatening. Pee Wee would have to rely on another parent to get to and from the fair. Since he was so excited about going, and he was such a dependable young man, the parents decided to let him attend almost as a reward for his good behavior and many achievements. Mr. Joseph agreed remarking how quickly Pee Wee used his problem-solving skills and set everything in motion to remove all obstacles standing in the way of him attending the fair. It was a rainy and dreary day in February and also kind of cool, especially for Floridians, said Mrs. Joseph, however, the fact that he had a free ticket and so many of his other friends were going moved the pendulum even further in Pee Wee’s favor. This would be his first time at the Florida State Fair, but not the first time he has been out without direct parental supervision. “This is a kid that we drop off at the movies, this is a kid that goes to the school’s student dances, this is a kid that goes to the mall, he’s acclimated to being in the public,” said Mr. Joseph. “Initially in our mind he was going to have to start driving pretty soon to get back and forth to town, so it was time for him to become independent outside of the neighborhood,” he added. The parents also said they had no reason to think their child would be in any sort of danger, after all, they were going to what appeared by all accounts to be a sanctioned event directly targeting young people, and the advertisements connected with the Florida State Fair depict it as an evening of fun with food, rides and face painting. There were no indications that the Florida State Fair could ever become an out of control environment in which the lives of teenagers would be in danger. “We said double check everything make sure you have your phone,” said Mr. Joseph. “Be where you are supposed to be when it’s time to be picked up, be careful and have fun,” Mr. Joseph advised his son. Gate where students were let out after being detained by police on February 7. The red arrow points to the location where Andrew Joseph was struck on Interstate 4. Each year, during the first week of February when the time for the Florida State Fair comes around, Hillsborough County students are given the day off and tickets granting them free admission to the fair. In previous years, ejections on the first Friday of the fair are common. In 2014, 99 were ejected and 12 arrested. Of those, 16 were young adults and the remaining 95 were under 17 years old. In 2013 there were 56 ejections and two arrests, in 2012 there were 48 ejections and 8 arrests, and in 2011 there were 93 ejections and nine arrests. Reportedly shortly after nightfall, February 7, a large number of those at the Florida State Fair became unruly. Police records show many incidents of robbery, assault, reports of underage drinking and narcotics use. Nearly 200 deputies were present, however, events spiraled so out of control that the decision was made to close the fair several hours early, at 10 p.m. According to Mr. Joseph, his son was either standing in line waiting to get on a ride or just getting off a ride with some of his schoolmates, when it came to his attention that some of his teammates were being arrested. Pee Wee went over to the area to check on his friends. Mr. Joseph said that was the kind of person his son was, he would always see if he could help another person out. They were being escorted to a detention area, when Pee Wee apparently caught up with the officers as they were being marched through the crowd. One of his friends, Robert, lost his hat, and Pee Wee apparently grabbed it to give it to him. 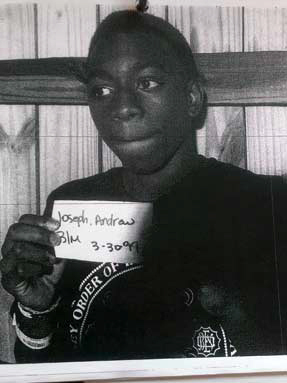 Andrew Joseph was photographed that night in a holding area. This was the last photo of him while he was alive. They were taken to a detention area and subjected to intense body searches, interrogation and were also photographed and entered into a database. Some of the young men were taken to a nearby juvenile detention center. Pee Wee’s only crime it seems, was inquiring into the circumstances involving his friends who appeared to be under arrest and being roughed up by police. He was ejected from the fair at around 8:30 p.m. and let out at the gate near Orient Road. He and a friend, 13-year-old Corey Thornton, were together and wanted to connect with those they were going to ride home with. The person whose cell phone number they were to call had a dead battery, so everyone was separated and out of communication. No one really knows why they attempted to cross I-4, a busy interstate at night when apparently there was a safe walkway near the interstate available. According to the Florida Highway Patrol at around 10:45 p.m. Pee Wee was hit by a vehicle driven by 19-year-old Jonathan M. Hatfield. Pee Wee was pronounced dead at the scene at 11:03 p.m. Corey made it safely to the other side. He said they were trying to get back to where they were supposed to meet their ride. Corey Thornton was with Andrew Joseph III the night he was struck by a vehicle trying to cross I-4. Corey was so shaken up that when he arrived at the location and got the ride home, he didn’t even tell anyone, including his parents what happened. 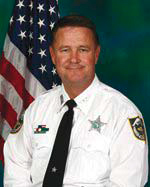 The Hillsborough County Sheriff’s Office released video showing those at the fair running in what the commander of the Department of Operational Support, Col. Jim Previtera, referred to as a “giant stampede.” A majority of those ejected from the fair were Black, and the term used to describe what was happening was “wildling.” That term is seen by many Black leaders as an offensive overarching term demonizing young Blacks. It was first used in mass media in the 90’s when several Black youth were wrongfully convicted of a brutal sexual assault in Central Park in New York. They were innocent, but they had been vilified in the media to such an extent that it was impossible for their side of the story to receive any exposure. Larry McKinnon, Hillsborough County Sherrif’s office public information officer. Detective Larry McKinnon, a public information officer for the Hillsborough sherriff’s department called it a tragic accident with responsibility shared by all involved. “Any time a child is killed, that’s unfortunate no matter what the circumstances are. It’s tragic, it’s a loss to our community, it’s the worst tragedy you can imagine not only for the parents and the family but for the community,” said Ofc. McKinnon. He said they analyzed the events that transpired the evening of Feb. 7 and many things will be reviewed and changed prior to the 2015 fair. “As far as the overall event, everybody has to take responsibility. These are our kids, parents have to take responsibility, the fair takes responsibility, we take responsibility, everybody,” he said. Dr. Carolyn Hepburn Collins, president of the Hillsborough NAACP said no one from any law enforcement agency reached out to the chapter in an effort to get ahead of possible trouble that comes with the start of the Florida State Fair. The first she heard of anything was on the news when it was reported that one of the young Blacks involved in the “wilding” was killed. Hillsborough County Sheriff David Gee did in fact write a letter and reach out to Black leaders, she said, but it wasn’t until after Pee Wee lost his life, and even then, the letter focused on addressing the alleged misbehavior of Black youth. Deanna and Andrew Joseph vow to prevent this from happening to any other children. “A 14 year old should not be ejected from anywhere, not even from school without notifying their parents. If this is supposed to be a school event that the school is going in with the fair authority, why do you eject a young man 14 years old out of a fairground?” she asked. The NAACP has a very aggressive legal redress division in the area and there are many complaints dealing with racial profiling by law enforcement, said Dr. Collins. Additionally, a June 9 letter to the Hillsborough County School district from the U.S. Department of Education’s Office for Civil Rights reportedly noted a complaint filed by local community activists urging them to look into allegations that Black students are subjected to harsher disciplinary action than White students. Racial profiling, lack of proper law enforcement preparation and response in this case, may have produced deadly consequences, she offered. Profits over safety and people? A previous analysis by the Center for Economic Development Research at the University of South Florida’s College of Business Administration found that the Florida State Fair Authority’s economic contribution to Hillsborough County is 1,023 jobs, $142.6 million of sales, and money wages and salaries over $35.6 million. 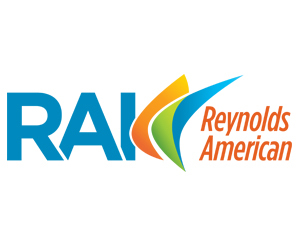 The net of local tax revenue over local tax expenditures attributable to the Florida State Fair Authority is nearly $1.9 million per year. The researchers reported that this influx of capital “ripples through a broader marketplace to produce incrementally greater contributions throughout the Tampa Bay region and the state of Florida.” According to their findings, cumulative contributions are in Tampa Bay: 1,183 jobs, $160.4 million of sales, and over $40.5 million in wages and the State of Florida 1,267 jobs, $171.4 million of sales, and over $43.3 million in wages. 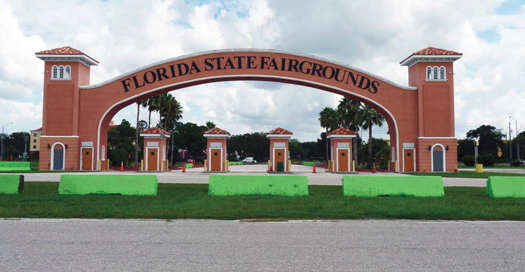 The Florida State Fairgrounds sits on 330-acres of land and runs adjacent to Interstate 4, and Interstate 75. Attorney Barry Cohen is handling legal matters for the Joseph family. According to a statement released from his law office, he believes indiscriminately giving away 100,000 tickets to young students is profit driven and although it appears as if policy changes by the Hillsborough County School district and the Florida State Fair Authority are in motion, it is too late for the Joseph family. The Florida State Fair instituted new rules, such as anyone gaining entry with free student tickets after 7 p.m. would have to be accompanied with an adult, and the Sheriff’s Office announced they would have more deputies and better communications equipment to quickly respond to troubles that develop. Many of his friends who were at the fair that night are still sad because they asked him a couple of times if he and Corey needed a ride. Pee Wee told them they would just wait. They couldn’t believe what happened once they heard the news. 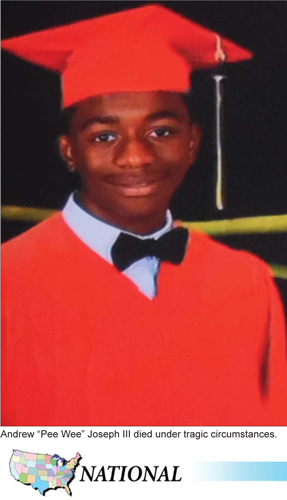 “I knew Andrew for a long time and it was sad to sit there and believing that it was true, because at first I didn’t think it was true that it happened,” said 17-year-old Jalen Harrison. “The tough part is—that we tried to make him come with us and we wish we would have just grabbed him and told him to come on,” he said. Mrs. Joseph said she is highly motivated to clear her son’s name, because in the initial news reports, Pee Wee might have been perceived as “a terrible kid so he deserved what he got,” she said. She was especially angered by the audacity of those who judged her and her husband’s parenting decisions. “Like you don’t drop your kid off at the mall, or you don’t let your kid go to the movies,” she said. “I just need to get the justice, peace and clearing his name and let the world know that every little Black kid that comes on TV is not going to be the one testing positive for marijuana. It’s not going to be the kid who was a trouble maker,” said Ms. Joseph. “This was really a good boy. This was a boy that came from a good home, good family. This was really a boy who didn’t run with the wrong crowd. This was a good boy and you all made a mistake,” she added. 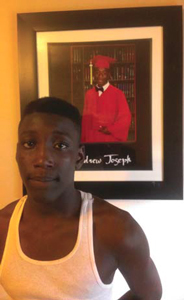 The family will continue to explore possible legal options and has started the Andrew Joseph Foundation. 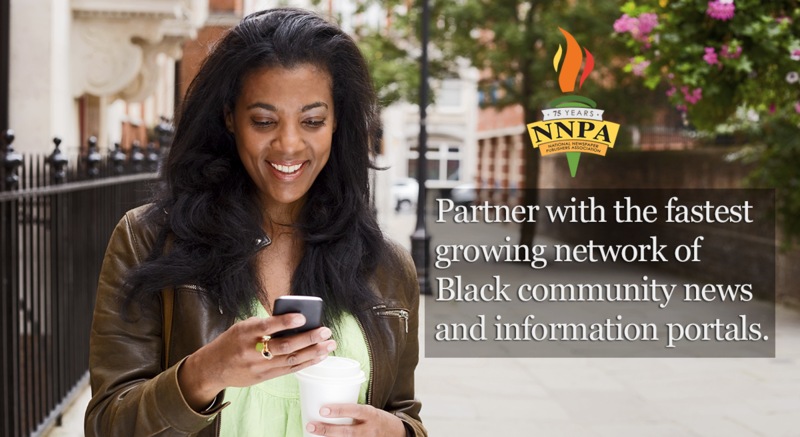 The foundation will work to ensure families have access to valuable information and resources to keep children safe.